First, I want to say “What did we do without Pinterest?” I have used Pinterest for a multiude of events, TV segments, etc. It is so much fun…and addictive! With the 4th of July upon us, this idea is really intriguing me. The holiday is known for the picnics, park festivities, and family fun. And, I think this is a PERFECT twist to the traditional picnic. Mason Jar Meals! 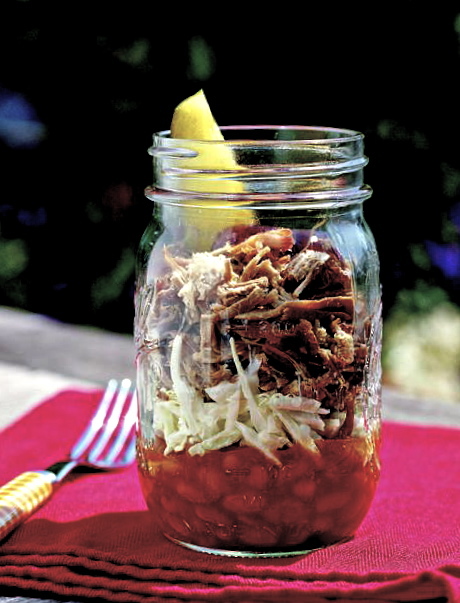 Serve the food in mason jars. Forget the serving bowls, forget the paper plates, and serve everything in mason jars. From the appetizers to the main course, you can find fun ways to put your meal in a jar. Now, there would be a bit of investment going into the jars, as well as the fact that the jars are glass. So, keep in mind, how many people are attending your picnic, as well as the location and activities that will be going along with it. You don’t want to bring a ton of glass jars filled with food and realize that the majority of the picnic attendees are children 6 and under. And, this one takes the cake! 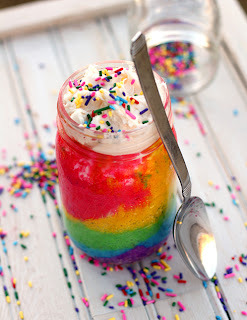 Who wouldn’t want to at least END the 4th of July picnic with a BANG and serve cake in a jar? This is a fun and easy recipe where you pick the colors of the cake. Hmm, I think I will pick red, white, and blue food coloring for this particular event? Mason jar meals are definitely on my ‘to do’ list! And, hope they will be for you too! If you give it a try, please share. I would love to hear how it goes and the response from your picnic goers. Why not give a little style to your 4th of July picnics?